High school students from the Coachella Valley have recorded an anthem which can be downloaded from iTunes to support the efforts of March for Our Lives, the organization which supports the end of gun violence in schools, following the tragic event at Marjorie Stoneman Douglas High School on February 14. A FIGHT FOR OUR LIVES was recorded by Musical Theatre University's premiere performing group “Generation Next” as a way for students to utilize their voices to add to the call for action to end gun violence in our nation and our nation's schools. 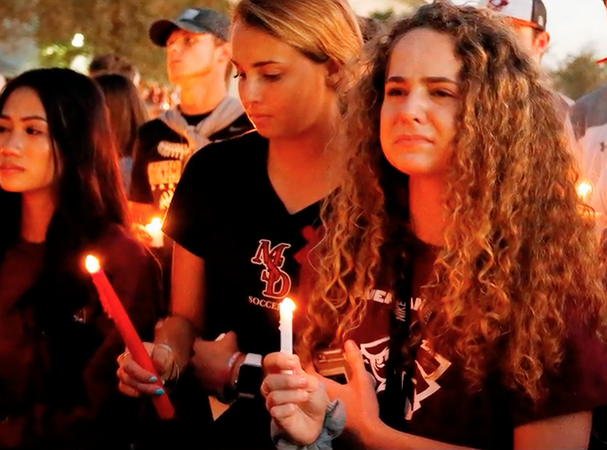 “After the tragic shootings in Parkland, Florida and the incredible way the students of Stoneman Douglas High School refused to stay silent, the MTU students gathered in my office one day after school looking for a way to join the cause, even though they are from the opposite coast and felt a bit isolated from the energy of the movement” said David Green, the school's founder and director. “Even though not directly affected by the specific tragedy, they were angry, frustrated and fearful and wanted to find a special way they could raise their voices in their outrage. Since they are singers, training for professional theatrical careers, raising their voices in song seemed a natural trajectory”. Green and the conservatory's musical director, Bob Marino, crafted a song for the students overnight trying to echo their sentiments and student appeals throughout the nation as seen in national media. The students asked that the song be utilized to raise money for the March For Our Lives movement, for the March 23rd events, and for the movement beyond. The song is being uploaded to iTunes where people can purchase a downloaded version for $3.99, with all proceeds will being donated to the March For Our Lives movement.